In his directorial debut, two-time Academy Award-Winner Robert De Niro also stars as Lorenzo Anello, a hard-working bus driver and family man, who must stand up to local mob boss Sonny (Chazz Palminteri) if he is to keep his son from falling into a life of crime. When Lorenzo's nine-year old son Calogero (Lillo Brancato) witnesses a murder committed by Sonny and refuses to identify the killer, the gangster takes the boy under his wing, gradually introducing him to a new way of life. Calogero learns about the virtues of hard, honest work from his father, who owns nothing but his integrity; but he learns about easy money and life on the streets from the man who owns them – Sonny. Calogero grows up under the wings of both men, torn between his own natural honesty and his fascination with the gangster. Now Calogero must choose between earning respect like his father, or commanding it like Sonny. Praise wasn't universal on its release, but critical reaction was generally postive, with Film Threat enthusing: "De Niro proves to be just as much a force behind the camera as he does in front of it. A superb debut – a gripping movie." It's been a while since I last saw it, but I remember liking it. The script was written by co-star Chazz Palminteri, based on his own play, and boasts a strong supporting cast that includes a certain Joe Pesci. 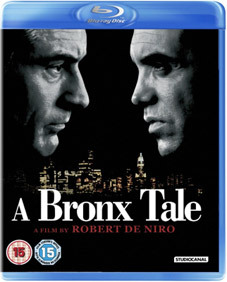 A Bronx Tale (1993) will make its UK Blu-ray debut on 18th June 2012 from StudioCanal at the RRP of £19.99.